Will Glazier, aka WillDaBeast, is officially a family man. You read that right – a family man. His son, Wesley, celebrates his first birthday Nov. 10. The last time I talked to Glazier was nearly a year ago and Wesley was barely three days old. What do they say? Our conversation this time around seemed dramatically different. Some part of Glazier had changed, evolved, grown. And this makes sense - being a father for a year will change a person. Parenthood, after all, is a transformative thing. Somewhere between changing dirty diapers, late nights spent in rocking chairs, and the immeasurable other things parents do for their children, Glazier remains dedicated to his musical pursuits. Being a father, he said, has made him more efficient with the use of his time and that too makes sense. If you want to dedicate yourself to something, you have to figure out how to manage all other aspects of your life as well. As the son of a travelling poet, Glazier has a deep understanding of what it means to be a creative performer and the head of a household. Him and his fiancé, Kaylee, take Wesley to many of the festivals and shows where he performs, which adds to his inspiration. 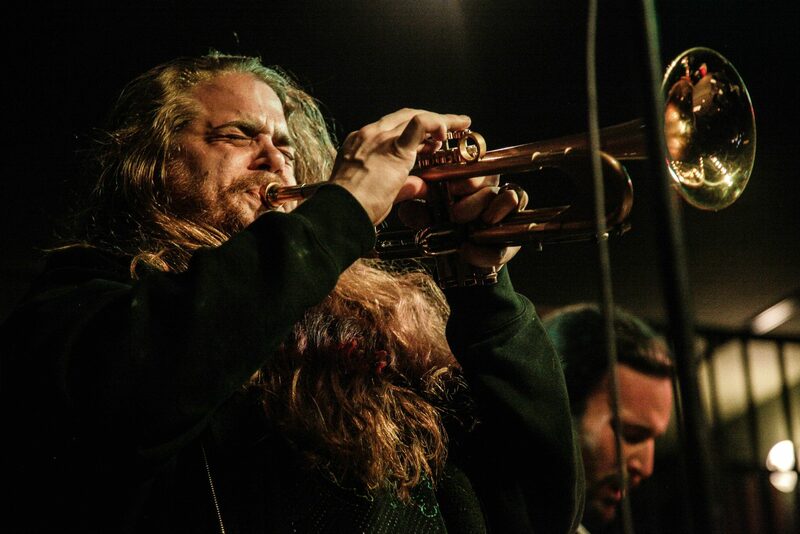 Time management and fathering set aside, Glazier is currently on tour as WillDaBeast with Michal Menert and the Pretty Fantastics (as well as in the band), a space jazz/psyche-funk group out of Denver. Rolling 14-deep in a 15-person passenger van. “It has been a crazy ride so far and we are definitely bonding,” Glazier said. They started in Philadelphia on the first of October and are scheduled to hit cities all the way from NYC to Tahoe. When I spoke with him they were on their way out of Buffalo, NY, Glazier’s hometown. He says that being back where he grew up was a powerful reminder of his roots and the lifestyle that has led him where he is today. The tour will take them down the east coast, up into the mid-west for a couple of shows, back down through Colorado to Seattle. From there they will head south for the last time to end the tour in San Francisco on Nov. 14. Feel free to take a moment and digest all of that. For those of you who have been reading closely, yes – he will miss Wesley’s first birthday, which will be hard, he said, but there will be time for celebration when he returns only days after. And, from what I can tell, that seems to sum up Glazier in many ways. He is not in a hurry to celebrate any particular thing because he is always celebrating something. We all know that person in this world and Glazier is definitely one of them. He is fueled by the creative energy of people around him. “I think it is important to note the supportive forces of those around me, which allow for travel and continuation of the pursuit for creativity in the arts,” he said. Motivated by his friends, family and fiancé, Glazier has laid down roots while maintaining a positive and forward-moving momentum. PNW fans can keep up with Glazier, as he will be dropping new songs on his SoundCloud (under Willdabeast), as the tour rolls onward. Many of these feature compilations with other musicians who found their names on SoundCloud and offer eclectic electronic grooves to accompany the electro soul of Glazier and his right hand man, Dan de Lisle. Eleven of the tracks are being released under Super Best Records, a label produced by Menert in Denver. It works as somewhat of an artist collective where creatives are working together rather than competing with each other. Glazier will be releasing his next WillDaBeast album, Stay the Course, on Nov. 5 at Barboza (Seattle). He says they are expecting a big turn out for this show with fans coming from around the region to celebrate the release. The tone of his music this time around can be expected as a narrative on the duality between creative pursuits in one’s life and important relationships. More details: Get more information about Willdbeast and the new record Stay the Course at www.willdabeastmusic.com or facebook.com/willdabeastofficial. Willdabeast is currently on tour with Michal Menert & The Pretty Fantatics; the closest show is at Barboza in Seattle on Nov. 5.